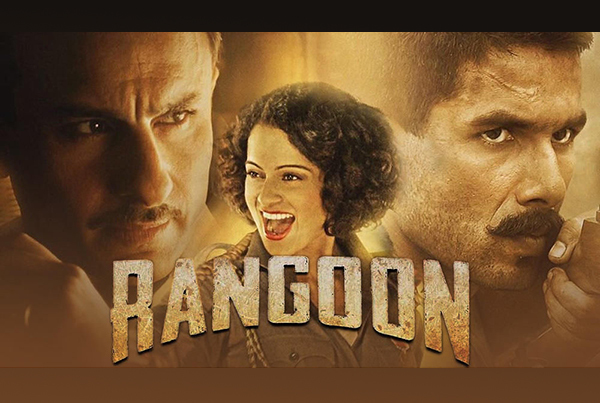 Rangoon is one of the most awaited films in recent times. The film is a war-romance set in pre-independent India. Mahatma Gandhi adopted ahimsa to get freedom; Subhash Chandra Bose was the force behind the Indian National Army that got on the front foot to boot the enemy out. An action star screen-named Miss Julia (Kangana Ranaut) rules Bombay cinema. Her professional mentor and producer, Rusi Billimoria (Saif Ali Khan), is a married man who treats her like a kid and calls her kiddo, loved in the way he thinks love is meant to be given to a woman, but not respected. Meanwhile, Billimoria becomes beholden to the British for business reasons. Circumstances force Miss Julia to travel to the Indo-Myanmar border where she must headline a series of shows designed to raise the spirits of the ‘British’ troops stationed there. This is where she meets Jamadar Nawab Malik (Shahid Kapoor), an Indian like so many others serving in the British army, and employed to keep his own people down. Ranaut delivers a seemingly effortless, chameleon-like performance as a woman who is by turns fragile and fierce, hurting yet invulnerable, a child who grows into a woman during the course of the film. The actress and the character she plays here, possess a body that is as intriguing as her mind: she appears delicate, yet explodes with energy and athleticism when life demands it of her. Saif gives his movie-entrepreneur act a razor-sharp quality. Rangoon is a sorely needed reminder that this Khan is one of the finest actors among all the heroes in Hindi cinema right now, the one whose versatility has been least explored. Shahid is outstanding. Though the love scenes are written well and aesthetically shot, they lack passion. The multiple lip-locks between Shahid and Kangana don’t ignite flames. The movie is picturesque. Colours come out of the screen and soothe our minds. Lighting and choreography are pitch-perfect. Being a period film is another challenge for Rangoon as special effects lack authentication in war scenes. The elaborate costume planning comes to rescue though. Still, Ranaut is remarkable playing the sort of character no Hindi film leading lady has been given for decades now. A big bow to Bhardwaj for that, and to the actress for choosing a path advocated by Gandhi, being the change she clearly wants to see in Hindi cinema. This action queen deserved a more vibrant film though. 6 Comments on "Rangoon movie review: Kangana, Shahid and Saif delivers a masterpiece"